The 164 metre superyacht support vessel Fulk Al Salamah has been delivered to Oman by Italian yard Mariotti Yachts. First announced in 2014 and developed under the codename Project Saffron, this project has been shrouded in mystery from the outset. Her overall length has been estimated from AIS data but any further details are unclear. She is believed to have a beam of 28 metres and a total interior volume of 11,000 gross tonnes. Fulk Al Salamah departed the Mariotti Yachts facility in Genoa on July 28, bound for Muscat. Her new owners are believed to be the Omani royal family. She is likely to be a replacement for the 136.34 metre Bremer Vulkan support vessel of the same name, which was used to shadow the 155 metre Lürssen superyacht Al Said — number four on our definitive list of the largest yachts in the world. As the image above shows, the new 164 metre Fulk Al Salamah features a large helideck, raked masts and a bathing platform. However, the lack of exterior relaxation spaces adds to the impression that she is a support vessel, rather than a superyacht in her own right. 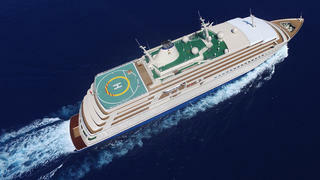 Nonetheless, she can comfortably lay claim to being the world’s largest superyacht support vessel. Other projects currently under development at Mariotti Yachts include the 55 metre explorer yacht Project Geo, which features styling inside and out by Luca Dini, and is due to launch in 2017.